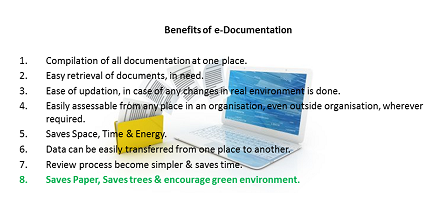 e-Documentation - Saves Space, Time & Energy. 1. Compilation of all documentation at one place. 2. Easy retrieval of documents, in need. 3. Ease of updation, in case of any changes in real environment is done. 4. Easily assessable from any place in an organisation, even outside organisation, wherever required. 5. Saves Space, Time & Energy. 6. Data can be easily transferred from one place to another. 7. Review process become simpler & saves time. 8. Saves Paper, Saves trees & encourage green environment. We add value to your documentation process. Companies has the loop drawings for old systems in hard or hand drawn formats. We provide support for digitization of these documents in excel, PDF, Word, AutoCAD formats. The datasheets of the instrument, equipment, electrical gears etc. are in old hardcopies, scanned etc. These are over written from time to time. We assist in digitisation of these documents in any format. Logic drawings are very important for trouble shooting, or in case of any modification & up gradation projects. We assist in converting these in standard formats viz. matrix, flow chart etc. The companies are doing many studies at their work place. These should be converted in to presentable reports that can be represented at special forums. We assist in report writing in word, pdf, ppt formats, or as required by customer. GA drawing are required to understand the layout, so as to plan for any type of further modification. Here we assist in re-creating new drawings in AutoCAD, EPLAN, PDF format. We provide value added assistance in developing catalogue for the new product being developed. Check sheet are very significant for identifying problems proactively, thereby sustaining equipment healthiness. We provide support in developing these checklist as per requirement. We also have standard checklist available designed with years of experience. Same can be provided in as is form or can be customised as per client requirement. Reverse Engineering is very important & widely used concept. This can be used to re-create required information. Many companies has system in place, without proper documentation. We study the system & prepare documents like GA drawings, Loop drawings, Cause & Effect drawings, Interlock Narratives, Specification/datasheets, Jb schedule, cable Schedule etc. .